WataugaWatch: Queen of the Buffet! Announcement came this morning that Congresswoman Virginia Foxx will chair the Republican National Committee's Platform Committee. Look forward to all the thorns of disapproval and whips of scorn. She is an obstructionist, she needs to be fired. Really? 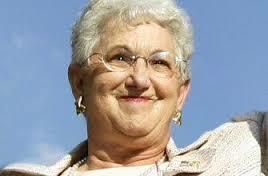 Virginia Foxx as the CHAIR? GOP really IS the party of "stupid is as stupid does." The Phyllis Schlafly of North Carolina strikes again.